Violence against women - whether it's physical, emotional, psychological or sexual abuse, in the home, in the workplace or the community - is a trade union issue. Every year the United Nations (UN) Day for the Elimination of Violence Against Women offers us all a mobilising tool to fight the problem with. 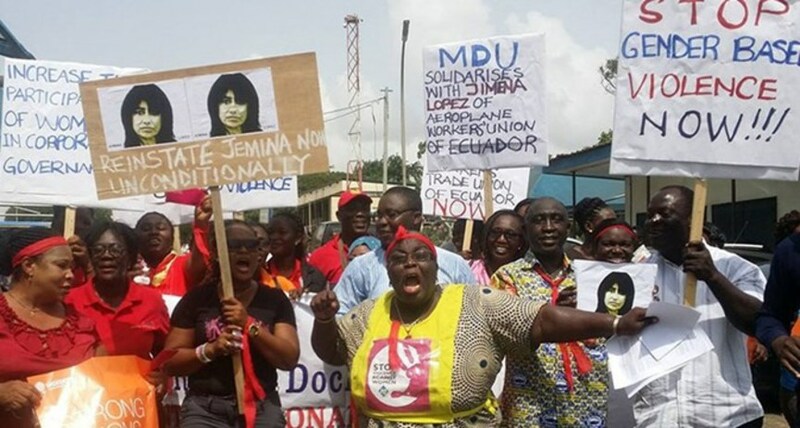 On UN Day 2014 the ITF encouraged affiliates for the first time, to join the ITUC campaign and lobby their governments for an International Labour Organisation (ILO) convention on violence and harassment at work. Over the last 3 years our aim has been to build an indisputable body of evidence of the gender-based violence that women who work in the transport industry face. This evidence can take the form of statistics and/or personal testimony and can be used to lobby national centres and governments. It can also be useful in negotiations with employers. We understand that for survivors violence can be impossible to talk about. However, worker stories (even anonymous ones) are incredibly powerful. They are a source of inspiration and power to other survivors and are difficult to discredit and minimise by employers and governments. As part of this ILO Convention campaign they can help us, at national and international levels, demonstrate the true impact of violence on workers lives. International Labour Conference (ILC) 2018 – one step closer to a convention? The 2018 ILC are the first set of discussions about the potential international law and we are encouraging all affiliates to lobby for representation in their National Centre delegation for this meeting next June. 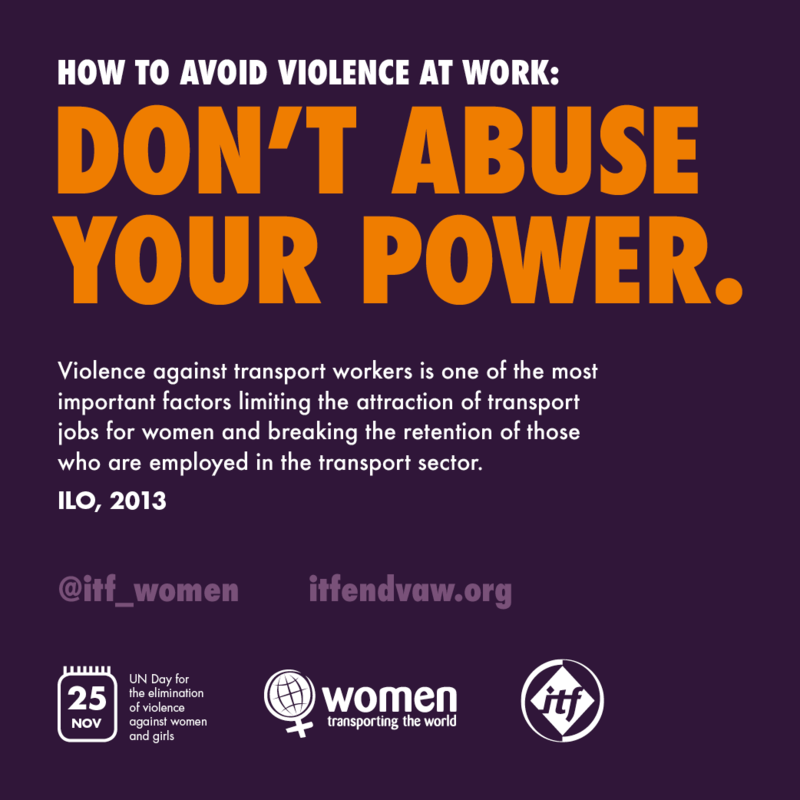 Armed with powerful and indisputable evidence, as an ITF affiliate, you have a real opportunity to support the case for women transport workers being at high risk of gender-based violence, and to provide the strongest possible outcome for women transport workers by influencing the language of any convention and recommendation. We’ve developed a number of resources to make it easier for you to get involved (see below) and to support your ongoing action on ending violence against women transport workers. Women in the Trade Union of Railwaymen & Transport Construction Workers of Russia organised activities around UN Day for the elimination of violence against women and girls. The ITF Guinea Conakry Women's Committee organised activities this UN Day which focused on ending violence against women in the workplace. The Transport & Dock Workers' Union in Mumbai, India held activities on 25 November UN International Day of Action. The MPTEU-HMS Women's Committee took action of the 25 November UN International Day of Elimination of Violence against Women. Women activists distributed pamphlets & post cards to employees in Chennai and urged port employees to give signatures and show their support to end violence against women transport workers. The General Secretary, G.M.Krishnamurthy, also participated in the actvities. Celebrations and workshops were carried out in Kenya for the 25 November Un day. The dockers and matatu union hung BTB-ABVV flags and wore 'Leave no one behind - End violence against men and women' purple t-shirts. Survivors of gender-based violence shared their experiences and long distance truckers of Mombasa sent messages of solidarity and support for Nermin Sharif in Libya. On 24 November, the National Federation of Indian Railwaymen held an event for the 25 November UN Day for the Elimination of Violence against Women. The Indian Women's Cricket Team Captain, Mithali Raj, attended and gave her support to protest against Violence Against Women and to End Gender Based Violence at Work. Amongst other activities and speakers, messages of support for Nermin Sharif were taken and shared. The All India Railwaymen's Federation (AIRF) organised an event on the 25th November, bringing together union officials and activists. Legislation was discussed as well as inviting an activist from NRMU to explain her own experience of violence and how the perpetrator was successfully brought to justice. The meeting was concluded by the General Secretary who called women to engage in union activities which seek to end violence against women transport workers.